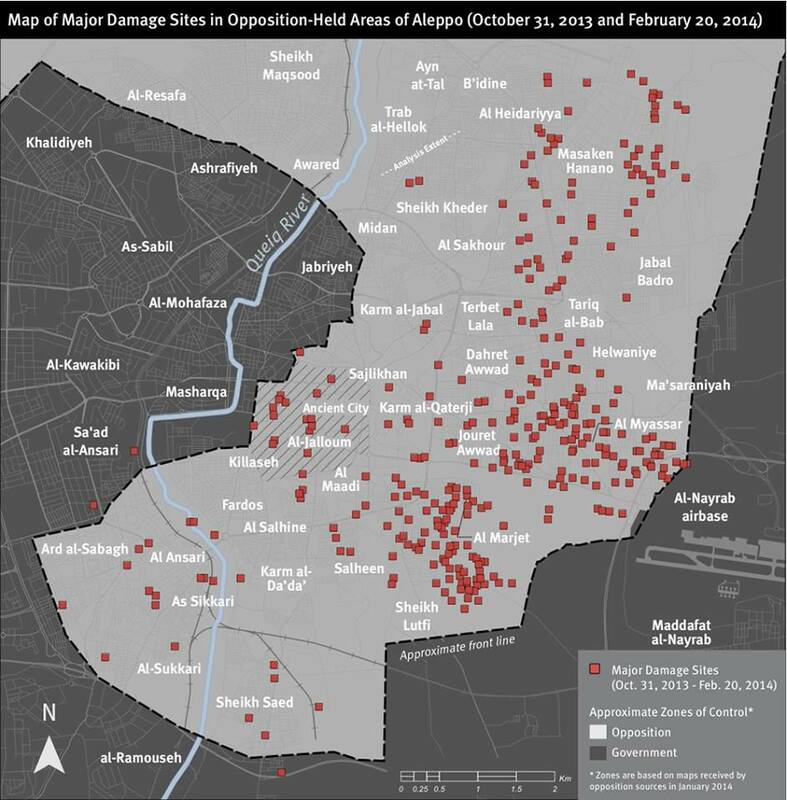 A new report by Human Rights Watch reveals the “indiscriminate nature” of the Syrian regime’s bombing campaign on opposition-held parts of Aleppo since November 2013, in which barrel bombs have mostly been used. 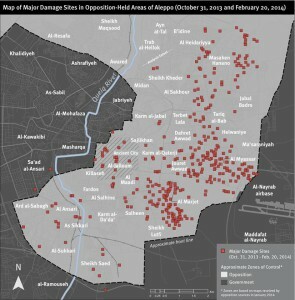 Local activists estimate that barrel bomb attacks on Aleppo have killed at least 2,300 civilians between November 2013 and March 2014. A UN Security Council resolution, passed on 22 February 2014, demanded all parties in the Syria war to cease “indiscriminate employment of weapons in populated areas, including shelling and aerial bombardment, such as the use of barrel bombs.” But nobody seems to be willing to enforce this and other resolutions. Meanwhile, the Violation Documentation Center in Syria has released a report documenting recent attacks by the regime air force on the villages of Idlib using Russian Sukhoi fighter jets. On 15 March 2014, the third anniversary of the start of the Syrian revolution, many towns and villages in Idlib were subjected to heavy aerial bombardment by these warplanes. During the attacks, regime forces used Russian-made, highly destructive vacuum missiles, which led to the death of more than 20 civilians, the injury of dozens and the destruction of many houses, according to the report. It is well known now that most of the Russian weapons provided to Bashar al-Assad’s regime are paid for by the Iranian government. This is not only impacting on the Iranian economy but also makes the Iranian regime complicit in these and other war crimes committed by the Syria regime forces. Then there are the war crimes and crimes against humanity committed by Sepah Pasdaran and the various Lebanese and Iraqi militias funded and directed by them. When and how will these people be brought to justice?